It must be December? Yesterday we received our first Christmas card in the mail. Ours are almost ready to send thanks to a school fund-raising project. This was Otis's first year making a card at school, it's made by stamping with Christmas themed cookie cutters and paint. Such a fabulous ideas for little ones. You can see our 2011 card here. The artwork is made on A4 then it is scanned and printed as cards. Today we bought a very modest tree. It smells good. The kids set about decorating it straight away. Otis loves the baubles a little too much and I think we might need to put them away for a while. I am loving the pom poms on the tree at thirteenredshoes and after noticing a pom pom garland tutorial at Design Mom I'm thinking it's this season's trend. 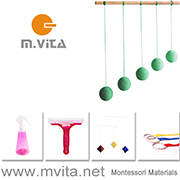 I have started collecting some Montessori related gift ideas on my Pinterest boards. I am so selective when it comes to gifts and this is reflected in the very few items I have pinned. Most of these items we own and I highly recommend or they are ideas I have for my own children. If you are looking for more ideas I suggest having a look through the stores of our sponsors on the left side bar. 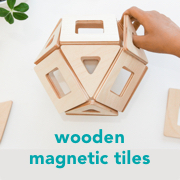 If you are in Australia Honeybee Toys and Dragonfly Toys or in the U.S Michael Olaf and For Small Hands have many great ideas. If you are in Canberra Childplay Toys have the nicest range I have found locally. We've almost finished shopping for our children. Caspar will be receiving a new microscope and a watch. The microscope he has is poor quality and is now broken beyond repair. I know he will love his first watch as he has the basic understanding of telling the time. He is now five, that feels like a good time for a watch. Otis will be receiving a balance bike. We've settled on the First Bike. I cannot thank you enough to all the comments on our Facebook page which made the decision much easier. Also a huge thank you to a dear friend who allowed Otis to test ride a First Bike. I found the First Bike with the lowering kit lower than most bikes which is great for the youngest of riders (Otis will be 20 months at Christmas). Otis will also need a helmet - any suggestions? I am still considering a little Waldorf doll for Otis and will have to make up my mind real soon. Many children in our lives will be receiving a fabulous children's cookbook that you may have read about. Caspar has taken the lead with gift giving and has some firm and excellent ideas (Gosh I hope Lucy likes Barbie!). As for receiving gifts we will be leaving that up to our friends and family this year. We won't be making any suggestions or writing lists. Caspar is now five so our friends and family have had five years to understand our parenting style. I'm sure we will still receive the odd gift that we wish was something different but I know all gifts will be given from the heart and with good intention. I love the diversity that comes into our children's lives from the gifts we receive from our friends and family. It's wonderful (it truly is) that our children are exposed to a whole range of ideas and concepts beyond what we as their parents feel is best or appropriate. If someone comes to me looking for gift ideas I'll give some general thoughts about the children's interests. There probably won't be as much homemade goodness here this year but I promise to keep you updated. You can read about our previous homemade decorations here and here.